Comfy and cozy 'nest' + quiet! Fisher Price Papasan Swing is an immensely popular product, with over 1,200 enthusiastic reviews on Amazon. So why do moms love this? Well, it's pretty simple - because babies love it! This swing is quite quiet, compared to similar models. Parents who owned several swings report that this is the quietest one they've seen. Toys that come with the swing are nice and provide good stimulation for the baby. Moreover, a good thing is that the toys tray is removable. So when you want the baby not to be overstimulated, but relax more and get to sleep, you can simply take the tray away. The canopy is lovely and the starry night show is visually stimulating and soothing for the baby. Cradle swinging works amazing. But you do have a front-to-back swinging option, as well. You can also have the baby sit in upright or reclined position. So there is quite some flexibility to suite your needs. The measures are 25.5 x15 x 13.8 (WXHXD) inches, it weights 22.4 pounds and it supports a weight of up to 25 pounds. It works with 4 "D" batteries or you can use the supplied AC adaptor to plug it into any standard outlet. So are there any concerns with this product? Well, there music and mobile are automatically shut down after seven minutes. So you need to start it over again via pressing a button. And the headrest is not removable, but it's a nice one so generally there should not be any problem. 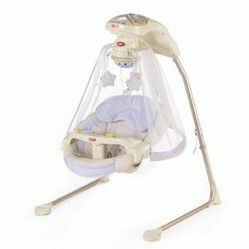 The complaints are minor, as most parents are very happy with this Fisher Price Cradle Swing. Is This The Best Swing Cradle For Your Baby? If you are looking for a top quality baby swing to soothe your baby, then Fisher Price Papasan Cradle Swing has received awesome feedback from over a thousand moms.